I love when I get to kill two birds with one stone and really get to integrate my crazy points hobby into my career. I booked the commercial gig shooting in Reading, PA that I previously blogged about, and I decided to book a night close to set instead of doing the five hour round trip commute from NYC. (duh). Most importantly, I booked a Days Inn because it will count as 1 out of 2 qualified stays in the current Wyndham Rewards “Gift Me” promo. As mentioned in my previous post about the promotion, every 2 stays gets you 6,500 points plus a 1,000 point booking bonus, which is enough to redeem for a free night at a later time. Based on the reviews of the hotel on Trip Advisor, I must admit that I was pretty horrified and intimated about my stay and was preparing for the worst. Location: Fantastic. The Days Inn Reading Wyomissing is located close to all of the major highways in Reading and there are several restaurants and stores that are close by. I was able to walk next door to a great sushi place, and let me tell you: you know you ordered too much takeout when they put 4 pairs of chopsticks in the bag, and you’re the only one who’s actually eating it. Enough said. Lobby/Check-In/Property Amenities: Check in was fast, and the front desk lady was friendly. The lobby was clean and very quiet. In fact, I can’t imagine there being more than 5 rooms occupied because all of the guest windows were dark and the parking lot is empty. There isn’t a gym on site, but I was told that I had access to Gold’s Gym a mile away. I’m too lazy to go at the moment, but I probably should. Ahem, Sushi Overload. Room: I must admit I was ticked off that I got the TINY, creepy corner room all the way on the 4th floor & I know that there are definitely better room options available. The bed is barely queen-sized and the TV is from the mid-90s. 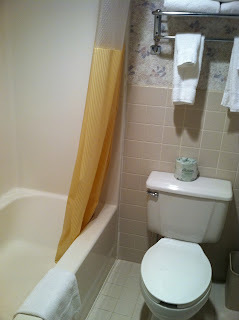 All though the room is disticntly-dated, the room and the bathroom are immaculately clean, and the bed is comfortable. I really don’t see why Trip Advisor reviewers butchered this hotel so much. That’s all for now. It’s time to rest up for day 2 of the shoot tomorrow!